Let me introduce myself to you as this is my first time here. I am Nice and a mom of two boys, a 5 year old and a 5 month old. That pretty much sums up who I am at present. My life these days revolve around my sons and when I find a breather, this is what I do as this is a real stress buster for me. Let’s move onto the review now. 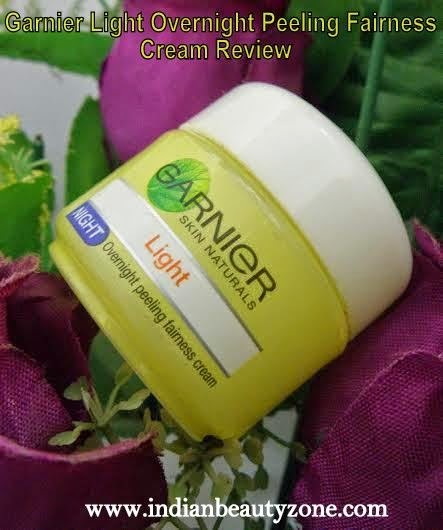 I am here to review an overnight cream, Garnier Light Overnight peeling fairness cream. This was an impulse buy for me when I was in search of an overnight cream. Garnier products have not fared very well with me. Read on to find out how this one fared…. 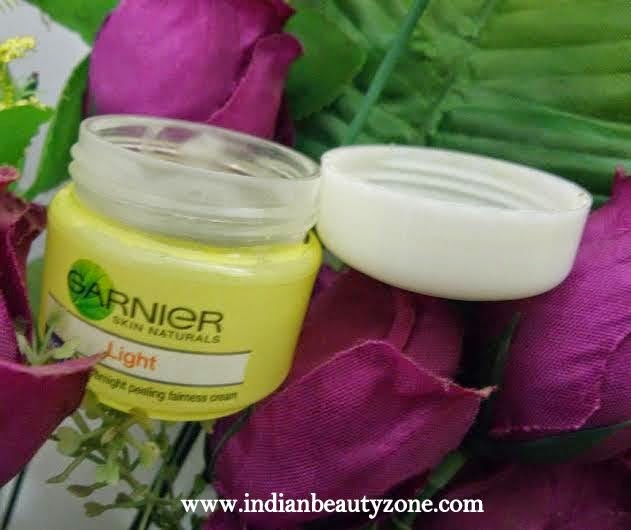 Why do I need Garnier light overnight peeling fairness cream? 1. Away from external aggression, night is the ideal time to reinforce whitening action. Light overnight cream has special natural micro peeling fruit extracts that help peel away dark cells and lighten the skin while you sleep. 2. Your day cream should be designed for the harsh outdoors. during the day use Light Daily Moisturiser SPF 15, which provides protection from UVA & UVB rays, and helps prevent appearance of dark spots. 1. Peels off dullness overnight thanks to an intensive exfoliation action to help remove dark cells. 2. Whitens the skin to reduce dark spots and further skin darkening. 3. Its melting texture moisturize and nourishes your skin overnight, leaving it smooth with a satin finish. 4. Melanin production is reduced (the pigment responsible for darkening and dark spot production). A unique night cream with an innovative micro-peeling action. Throughout the day harmful sun’s rays, dust and pollution produce dark cells on your skin. 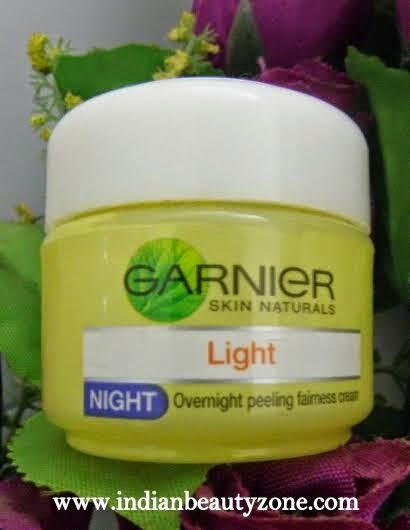 Peel them away while you sleep with Garnier Light Night dual formula. 1. In the morning, your skin is fresh and fairer. 2. Skin looks fairer in 28 days, dark spots reduce. 1. Apply every night on perfectly cleansed skin. 2. Gently massage into the skin using light circular movements, moving from the center of your face outwards, and away from the base of your neck to the top. It comes in a tub-like packaging with a screw on lid making it travel friendly. well onto the skin and takes a while to completely seep into the skin. What is my opinion about the product? Well, I was on the lookout for an overnight cream that was decently priced and some of the reviews about this cream I came across elsewhere were not all that bad either. So, I decided to give it a try. I used this every night after my bath before bed. It spreads nicely onto the skin but needs a little bit of work to send it right in. I have extremely dry skin and hair with a slightly oily T-zone. However, I found this cream to be a little oily even for my skin type. But the smell is amazing. Just what you’d need after along day. On looking at my face the next morning, I did notice a glow and fresh look. It does work in that department and upon continuous usage I did notice a slight reduction in my dark spots. But, remember that I am a stay at home mom and hardly step out of my house during the day time. So I cannot vouch this claim for all the ladies out there who have sun related dark spots. I cannot vouch for the “fairness in 28 days” claim either as I was basically not looking for that. The only major con I found with this was that it broke me out several times initially!!!! But then that too settled after continuous usage. Also, I found that if you stopped the usage for a few days the face would go back to how it was before…. 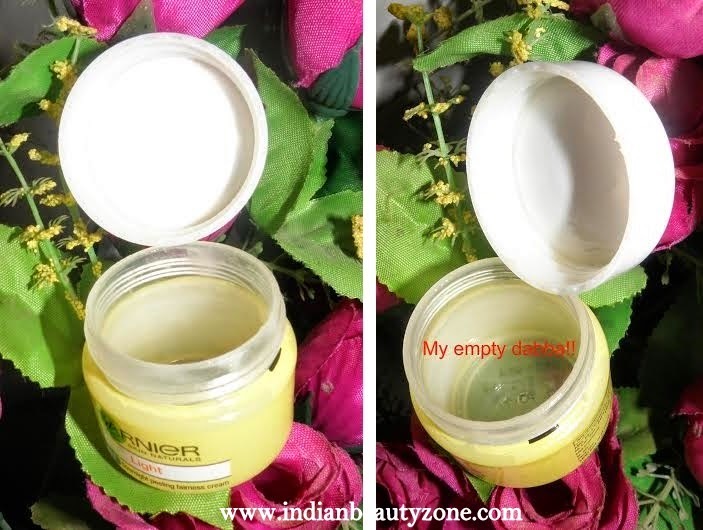 Now, I have completely hit bottom of my tub and got myself Himalaya night cream which I can review if need be to find out which I prefer more. ♦ Upon stopping the usage the face goes back to square one…. Now, if you are on the lookout for a decently priced overnight nourishing cream, then this could be it. It works pretty decently but don’t expect miraculous changes to the face. Continuous usage might give the desired benefits!! I think I will repurchase this one again as I was pleased with the results. I would give a rating of 4/5. My name is Nice and I am a stay at home mom of two young boys aging 5 years and 5 months. All the free time I get got me hooked onto skin care and hair care which I looked up for on the Internet thereby landing in this vast ocean of beauty blogging and reviews and make up tips etc.... I have dry skin with a slightly oily T zone and very dry hair. Even summers are torturous for me. I am medium fair to wheatish complexion. I love reading and now obviously writing reviews. I am more of a Skincare haircare enthusiast than a makeup one with the exception of lipsticks. So, what do you have to sat about this cream…. Sounds like a nice cream. I've tried a moisturizer from Garnier before and I quite like it. Check out my new blog post! Yes it is for the price Naomi. That's a nice blog you have there. Is it that orange colored bottle.....something cocoon??? I like it too. In fact it is the body lotion I use in winters. Thanks Lisa. This one broke me out too initially and then became fine. Thanks for reading Garima. Nice review. The product looks good, but I don't like that it is a bit oily, I do not use such texture during summer. Oh really! I must try the VLCC one now.Thank you Saniya. Seems good for dry skin. Lovely review dear!